This section of the website is dedicated to connecting you with the latest news and information in the CP world. Over time we will further divide this page by subject. For now, you will find general subject headings until we collect more material for this section. Please contact us about related news you find that we may include here. 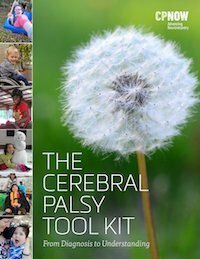 We also have a section with information about cerebral palsy treatments and interventions and related research that you may wish to visit. CP Registry—Here you will find access to a national database called “The Cerebral Palsy Research Registry”. It is a multi-institutional collaborative effort with a mission to improve the understanding of cerebral palsy. By registering you are expressing your interest in connecting with researchers who may wish to potentially enroll your child in research studies. Signing up for the registry does not directly enroll your child in research studies. Clinical Trials—Here you will find a a database of current clinical trials going on throughout the country. If you have an interest in having your child participate in a particular study, or wish to find our more information about one you have heard about, you should be able to find it here. The American Academy for Cerebral Palsy and Developmental Medicine presented the Best Scientific Paper Award for 2013 for the following research paper: Reduced Satellite Cell Population in Hamstring Muscles from Children with Contractures. This is a fascinating study!! Is Intranasal Midazolam Better Than Rectal Diazepam for Home Management of Acute Seizures?